https://www.geoguessr.comThe Warren & the World is Story Warren’s weekly newsletter, providing a round-up of our favorite things from around the web as well as a review of what was on our site over the past week. We’re glad you’re here! Heather Walker Peterson explores the value in reading books about characters whose lives are different than her family’s. “What’s it like to live there?” She asks, and I can inform her from childhood experience. “It’s nice,” I say. Rachel Schmoyer digs into the bitter and the sweet of this season. Today my four children get back on the bus to start a brand new school year. This year I have two children in middle school and two in elementary school. My youngest has been counting down the days for over a month. She cannot wait to get back to the classroom! My middle schoolers have been counting down the days in a different way. They have been counting down how many days of freedom they have left and cherishing every one. It’s hard sometimes to balance the pursuit of our own creative interests and family life. This interview with Michelle B. Radford explores that balance. This summer, the Leaf Institute of Art and Vocation, a nonprofit aimed at integrating art education, vocational formation, and the Christian faith, opened its doors in Greenville, South Carolina. Located in the growing arts district of this mid-sized Southern town, Leaf’s faith-driven mission sets it apart from surrounding studios. Its co-founder, Michelle B. Radford, is an educator and studio artist, as well as a mother to young children. Instead of viewing motherhood as a barrier to her artistic calling, Radford has learned to embrace the inherent tension between the work of raising a family and the work of creating fine art. Our friend Sally Lloyd-Jones writes at Ann Voskamp’s blog on figuring out how to live loved. I’ve just returned from our annual family vacation in Cornwall. In the very early morning, my little sister and I would set off with our nets in search of ponds, and tadpoles, and adventures. I love Cornwall. It’s wild. It’s romantic. And stunningly beautiful. Geoguessr drops you in a random spot in Google maps and you have to figure out where you are just by looking around! There are multiple maps to choose from to either broaden or narrow the guessing area. I hope you enjoy this world-wide guessing game! It is a pleasant summer evening, and I lean over the rail on the deck, looking out at the backyard. The air is full of the buzz of crickets and cicadas, and a thin frosting of pink clouds covers the sky. Fireflies rise over the grass. The high branches of the maples and pines stir in a slight breeze. The coming school year looms large in my thoughts. I have spent the day scouring curriculum sites, reading reviews, visiting web pages, and picking the virtual brains of homeschool moms. I wonder if my fourth-grader should learn to type this year, or if we should try Dave Ramsey’s Financial Peace Jr. course. John Sommer recommends the wonderful Abel’s Island. Why is it that so often our life in this modern world prevents us from living; no time for pausing or reflecting? Days roll into weeks, weeks into months, and before we know it, it’s Christmas. After a week or so of vacation we are suddenly packing up the Christmas and New Year’s decorations. Then it is time to put out the new calendars and we start making resolutions all over again. If back-to-school has you missing the time with family that summer provides, consider some of these family activities during the season. Slow motion is so cool. 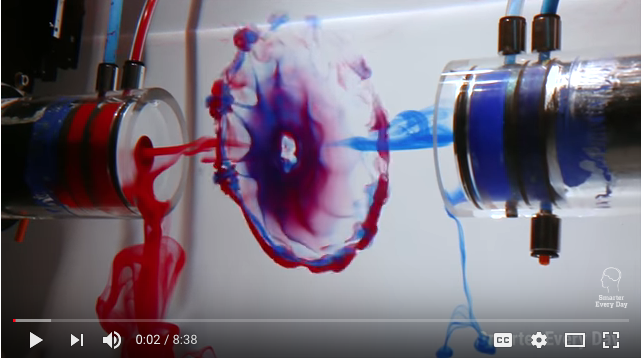 Destin at Smarter Every Day has a video about vortex rings colliding in slow motion. Which is so cool. Thank you for reading. We’re on your side. Carolyn Clare Givens is displaced Northerner exploring the foreign ways of the south.